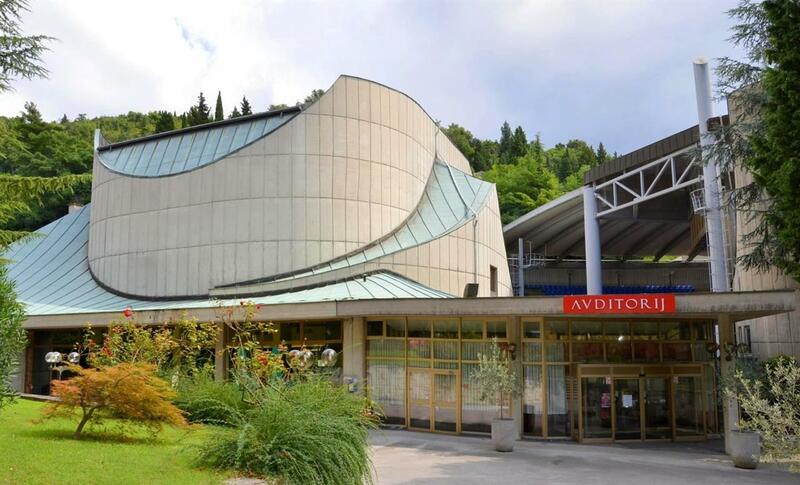 The beginnings of the Portorož Auditorium (Avditorij) date back to 1972 when it operated as an institute for promoting tourism. Its basic activities were conventions, cultural events and the screening of films. The setting up of the festival, convention and event halls was conceived by the Auditorium’s first director, Nino Spinello, whilst the appearance and the name ‘Avditorij’ are the work of the famous architect Edo Mihevc. Initially the Auditorium was the centre of convention and event activities, however, later this role was taken over by hotels offering such facilities. The main hall, and in particular the outdoor amphitheatre, which together can accommodate up to 2,300 visitors, still remain an interesting venue for holding events and are worthy of the attention of event organisers. It could be said that the Auditorium is in the centre of Portorož as well as being at the heart of events in the areas of culture, performances and shows, and promotional and congress activities. The Auditorium is a modernist building, which is considered an example of unique architecture, and has today become an indispensable feature of Portorož. It is only now that we can really comprehend the idea of architect Edo Mihevc, who designed the Auditorium as a new centre of the town that is adapted to the environment, set in an area of Mediterranean greenery, and its height is appropriate in relation to its surroundings. It seems that only time has revealed the true value of its location and architectural design. Portorož is the most important centre of tourism on the Slovenian coast. The convention centre is in the heart of the town close to all the most important road connections in Slovenia, thus it is easily accessible. The closest airport is Trieste, which is 80km from Portorož, whilst Slovenia’s main Jože Pučnik airport near Ljubljana is 150km away. There is a small local airport in Sečovlje which is only suitable for light aircraft. The key problem is aviation accessibility in terms of regional access, however, Portorož is close to all the key congress markets in Central Europe. The architect Edo Mihevc combined traditional forms of living with a modern design and protected green areas. The basis for the building’s design and construction were the Mediterranean climate, local building materials, pergolas, loggias, terraces, scarps, and windows with shutters. In the case of the Auditorium, these were upgraded with modern solutions and innovations by the use of a ferro-cement construction. In our opinion, it is an example of exceptional architecture that defies time, however, it requires some major improvements, especially in the interior. This would significantly improve its competitiveness, as currently it unduly suffers mainly due to its poor image. The Auditorium team is under new management of the legendary director and producer Dragica Petrovič, who has introduced fresh energy to the work of this public institute, especially in the area of cultural events. At first glance it seems as if the team of 13 is somewhat lacking in enthusiasm, however, it is experienced and capable even when it comes to arranging the most demanding of productions. Numerous references and over 250 events per year are testament to this. There is still great room for improvement in the area of marketing. The Auditorium’s main hall, with 479 seats, and the four meeting halls, that can accommodate from 20-100 participants, form the heart of the congress facilities. The halls are relatively well maintained, however, they are showing some signs of age. A great additional feature of the venue with added value, however, is the outdoor amphitheatre, which is also a special feature of Portorož and enriches the town’s range of tourist facilities, as numerous concerts are held there. The Auditorium employs the services of local catering companies, whilst the centre itself is home to the Kavarna Avditorij café. The cultural programme of the Auditorium, however, is more important than its catering facilities. As a public institute it organises numerous cultural and entertainment events, and in doing so performs a broader mission in the municipality’s cultural programme. Almost 200 events per year are held at the Auditorium, which range from popular music to various demanding music, film, theatre and modern dance productions. These activities greatly enrich the cultural pulse of Portorož and Piran, and also contribute to the attractiveness of Portorož as a congress destination. Renovations of the interior and technical equipment would greatly improve its competitiveness. Currently it rather relies on its charm and its legendary halls, which are insufficient for the demanding congress market. Although we would like to see renovations to the interior of the Portorož Auditorium, we most definitely wouldn’t want the main hall to lose its positive energy. All those who have stepped onto its legendary stages like to confirm this. The Portorož Auditorium is more than just a classic conference centre. In recent times it has mainly operated as a cultural centre, which performs an important public mission. The fact is that it has all the right conditions to once again become an important conference centre. Its former congress glory is still in the subconscious of event organisers who, however, who have succumbed to the aggressive marketing of the competition of Portorož’s hotels. Actually, however, the Auditorium is still an interesting alternative and it is time that it once again steps into the congress scene.